LAGOS, Nigeria (AP) — The deep, croaking-frog rhythm of the talking drums sound out across the stage as canoeists in animal hide row a condemned servant and royal infant into the unknown. The unified voice of a choir rises above the beats, singing in the Yoruba language of Nigeria's southwest at the start of a play that begins in its middle. This isn't the William Shakespeare you know. Instead, this is an African reboot of "The Winter's Tale," one of the lesser known tragicomedies written by the Bard about a child princess cast away out of jealous rage and later reunited with her royal family. 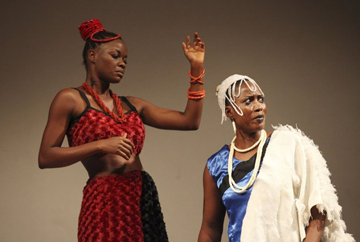 A theater company in Nigeria is performing their version of the play, called "Itan Oginintin," at Shakespeare's Globe in London for a festival showing 38 Shakespeare plays in different world languages as part of the London Cultural Olympiad. For the Lagos-based performers in the Renegade Theatre company, the chance to perform allows them to represent a country whose rich history in the arts has faded under corrupt governments. "Some time between the '80s and the '90s, I think a bridge collapsed," said Wole Oguntokun, who leads Renegade Theatre. "And now we are all looking for a way across that bridge." Nigeria remains home to Nobel laureate Wole Soyinka, the aging playwright who Oguntokun used as a muse for a play he wrote about the essayist's tangles with the military rulers who once governed Africa's most populous nation. But while the military built the country's National Theatre in Lagos, a massive building in the shape of an officer's cap, it now sits largely unused and in poor condition. Most Nigerians' experience with acting are from over-the-top performances on television soap operas and Nollywood movies. Slowly, however, Oguntokun and others have staged performances. The production of "The Winter's Tale," Oguntokun hopes, will bring new focus on the value of stage acting in Nigeria through its two performances at Shakespeare's Globe, a replica theater built in London to model the one where the Bard's plays once were staged. The theater will stage 38 of Shakespeare's plays in various languages as part of a festival leading up to the Summer Olympics in London. While Swahili and the languages of South Africa and Zimbabwe will be featured, Yoruba represents the only West African language to be a part of the festival. But it is a formal style of Yoruba that goes unheard in Lagos, Nigeria's largest city, where its words get mixed into English and pidgin. Some actors who tried out for the play couldn't handle the archaic bits of the language thrown into the play, Oguntokun said. Those who made the cut found their own ways to handle it. "I used to read the Yoruba Bible when I was small when I went to church, so I went back to the Yoruba Bible and started reading over and over again," actor Rotimi Fakunle said. "It was easier for me to switch." 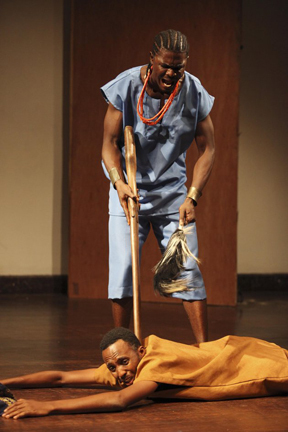 The Nigerian performance also includes significant changes from the original text, as the royalty imagined by Shakespeare become the volatile Yoruba gods Ogun and Sango. The character Time, who keeps track of the plot for the audience in the original text, has been replaced by a traditional singer. Oguntokun wants this type of traditional African storytelling to grow stronger in coming years, and gain even more international attention. "We will tell our stories and not have our stories told to us all of the time," Oguntokun said hopefully.